The 1107 EX compactor features the new powerful 4-cylinder water cooled Tier 3 engine that delivers up to 102 hp and 16% more torque compared with the previous model. 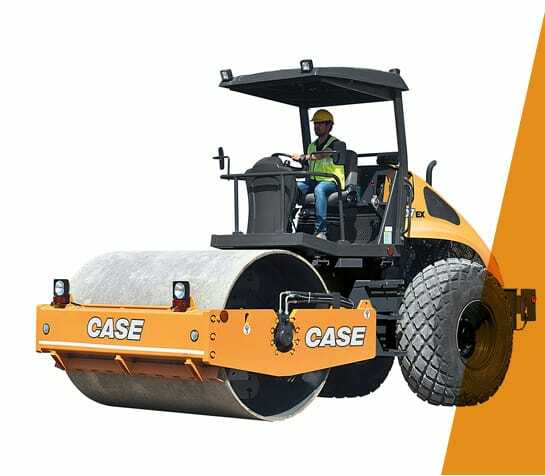 With more than 3 million units operating all over the world, including the CASE 570T backhoe loader, the engine assures an excellent reliability. The turbocharged engine is equipped with an air aftercooler system with internal EGR that increases the density of the intake air, improving efficiency and reducing fuel consumption. Coupled with the turbo pre-cleaner, the water cooled engine ensures excellent cooling and high fuel efficiency : -5% compared with the previous model. The 1107 EX-PD with drum drive and clamp-on pad foot for compacting more cohesive materials such as clay and silt The optional drum drive system features an additional high torque drive motor mounted on the front drum frame, resulting in excellent gradeability (36%) and optimized traction. 2 vibration stages provided by a variable displacement bidirectional axial piston pump with electrical displacement control allow effective compaction of a wide range of soil types. Download CASE Compactors brochure now!